What is the Te Tai Hau-ā-uru Investment plan? 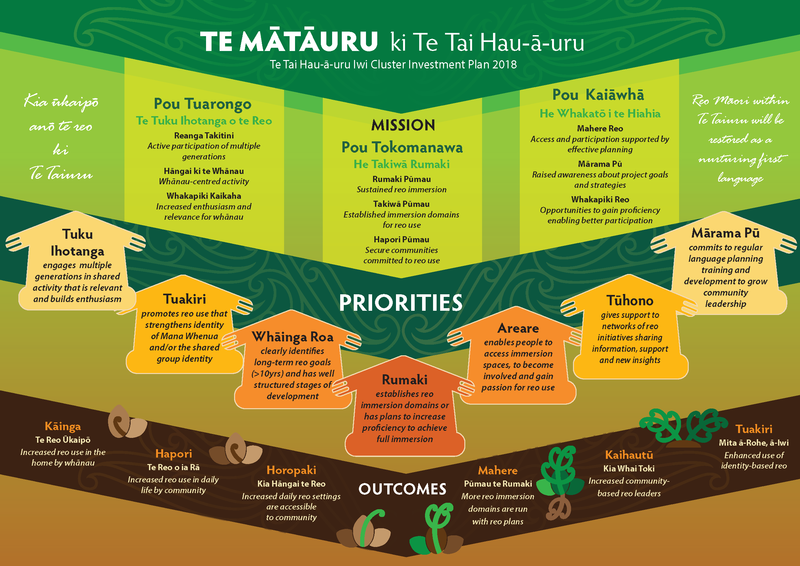 Te Mātāuru ki Te Tai Hau-ā-uru is the plan for how Te Mātāwai will be investing in reo Māori revitalisation in the Te Tai Hauāuru rohe, also refered to as Te Taiuru. The region broadly encompasses Iwi from Mōkau to Turakirae, and the 21 Iwi listed in the Te Tai Hau-ā-uru cluster in Te Ture mō Te Reo Māori 2016. The Te Tai Hau-ā-uru Investment Plan was developed by a core group of reo Māori advocates across the wider Te Tai Hau-ā-uru region including representatives from Iwi within the four peka: Te Upoko o te Ika, Tararua/Ruahine, Whanganui, and Taranaki. The plan aligns with the Maihi Māori as an overall strategy for reo revitalisation in homes and communities. Te Pae Motuhake mō Te Tai Hau-ā-uru, also known as Te Whāiti is the Te Tai Hau-ā-uru Cluster Panel who will monitor the plan alongside Te Mātāwai. All Māori language stakeholders within Te Tai Hau-ā-uru and the 21 Iwi listed in the Te Tai Hau-ā-uru cluster of Iwi have a direct interest in the implementation of the plan. What are the key parts of the Te Tai Hau-ā-uru Investment Plan? We want to see and hear reo Māori being usedn aturally and widely in communities throughout Te Tai Hau-ā-uru. We want to promote reo Māori being acquired as a nurturing first language in the home and communities. Supporting parents and grandparents to be transmitters of the language to younger generations. Supporting whānau, marae and communities to create and implement language plans. Supporting long-standing Māori language organisations to create and maintain immersion opportunities within communities. Increasing opportunities for shared activity and communication among initiatives. Increasing access and support for people to participate more effectively in immersion environments. What are the plans priorities? What are the plans outcomes? Te Mātāuru ki Te Tai Hau-ā-uru investments target the use of reo Māori in the Te Tai Hau-ā-uru region.The Te Tai Hau-ā-uru representative on Te Mātāwai, Ruakere Hond, and the newly selected Te Whāiti ki Te Taiuru (Te Tai Hauāuru Cluster Panel), have developed Te Mātāuru ki Te Tai Hau-ā-uru (Te Tai Hau-ā-uru investment plan) specific for this region. The plan prioritises seven key approaches to guide how investment will be made. Your proposal must describe how it will implement one or more of these approaches. The greater the range of approaches your project includes, the stronger your application will be considered.